Join us on March 26th from 6:00-7:30 PM for a Small Biz Session! 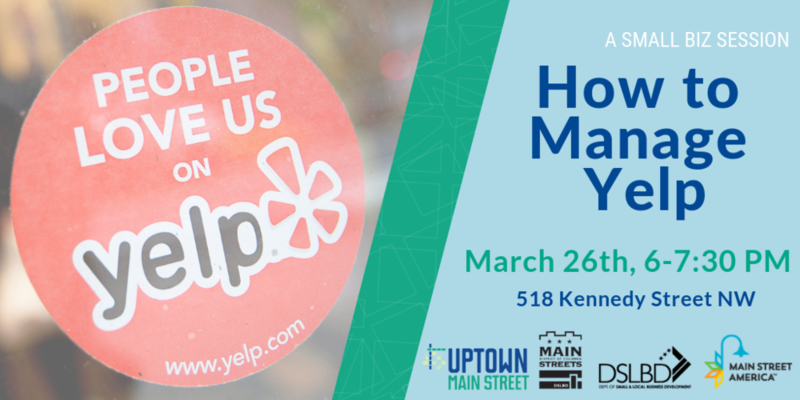 These free workshops are open to all members of the small business community and generously sponsored by Uptown Main Street's donors and grantors. Nearly 75 percent of consumers searching for a local business first turn to online review sites. As a small business, it's important to not only be aware of your online presence, but to take steps towards improving it. In this session, we'll focus on managing your business' Yelp page. We'll take a look at everything from the importance of good photos, tracking activity and insights, responding to reviews and updating your page for accuracy.